Save big on various products for Check-R-Board Day at H&S Feed! 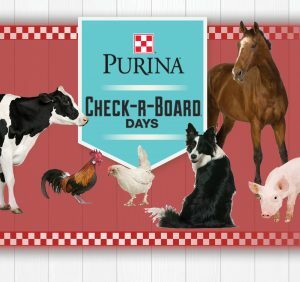 Come by the store for big savings on Purina products, sheds, sunflower seed, and more during our Check-R-Board Day on Saturday, August 25th from 8 AM to 3 PM at H&S Feed. Join us for a free Barbeque Lunch from 11:30 AM until 1 PM! Take advantage of the drawings going on throughout the day with the grand prize being a Spring Valley shed giveaway! There will be multiple events going on throughout the day including a microchip clinic with Mahaska Vet Clinic. Professional Dog Trainer, Mr. Tory Topping, and Traeger Rep, Jonathon Fieler, will also be stopping by to host events during the day. Don’t miss out on the best opportunity to stock up on various products at these incredible prices. *see stores for details and restrictions that apply. Special pricing on select items is good for one day only, Saturday, August 25th. Visit us on Saturday, August 25th from 8 AM to 3 PM to reap the savings during Check-R-Board Day at H&S Feed & Country Store! Take a look at more information by viewing our flyers. This entry was posted on Thursday, August 9th, 2018 at 2:29 pm	and is filed under Events, News & Updates, Specials, Videos. You can follow any responses to this entry through the RSS 2.0 feed. Responses are currently closed, but you can trackback from your own site.